We have few images of the property that was 2 Chapel Street in Thornbury. These premises were demolished as part of the plan to build the Armstrong Hall and the entrance way to it. The photograph on the left is the best we have at present. It shows 2 Chapel Street as a double fronted property with railings out side, next to the Cossham Hall. The car by the Chapel sadly prevents us from having a clearer view of the house. 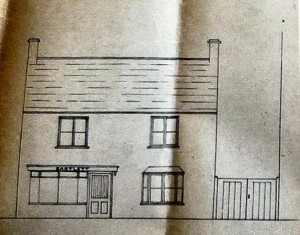 The sketch below on the right was made in 1929 as part of a planning application for a slaughter house and cesspit constructed at the rear of the property. In 1789 an indenture relating to the purchase of the Cossham Hall described the neighbouring (2 Chapel Street) property as belonging to Mary Hewett and occupied by Isaac Mullington. Mary Hewett and the Widow Hewett. At this moment we have not identified this person (or these ladies). We know from the Land Tax records that Mrs Hewett or the widow Hewett continued to own this property until 1821. In an indenture relating to the Cossham Hall dated 1822 the owner of this property was “formerly Mary Hewett”. Although James Ford is not an usual name in this area, we believe that this James Ford was an inn holder who owned a large parcel of land including all of Laburnum Terrace (the terrace of houses at the top of the Gloucester Road) and the surrounding property. By 1841 James and his wife, Lydia had moved to Bredon in Worcestershire. By 1851 they had moved to Castlemorton in the same area. James was aged 67 by this time and described as a farmer of 32 acres. It is possible that while James Ford was in Thornbury his home was in what is now Clematis Cottage in Castle Street and was once the Greenhouse. We have indentures of 4 February 1828 and 14th May 1830 that show that Alexander and James Smith sold to Thomas Gwynn for ‘All that messuage or tenement called Greenhouse (where Ann Thurston lived, afterwards in the possession of Jane Bridges since John Crowther, afterwards Christopher Young since Richard Gwynn and late of James Ford as tenant). ” Read about Clematis Cottage. Jesse Cossham. In 1859 the rate book describes this property as in ‘Back Street’ and says that it is owned by Jesse Cossham and occupied by Thomas Facey. 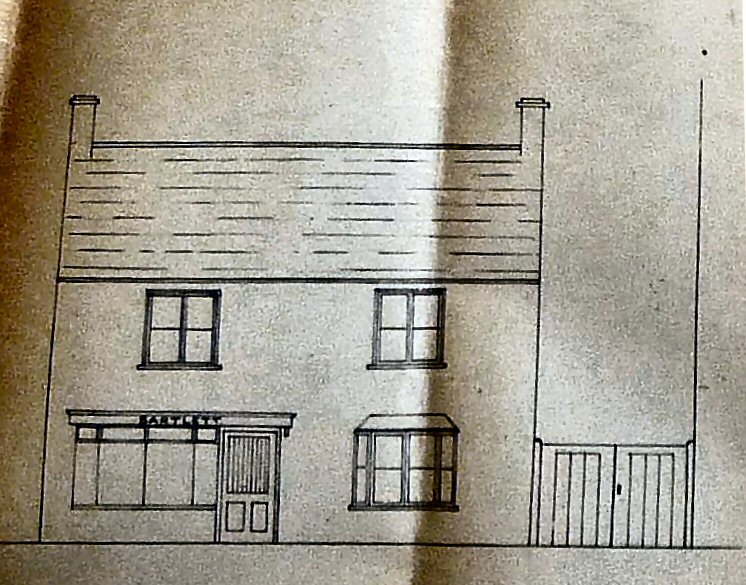 However we know that the next property listed in the Rate Book is the Wheatsheaf Inn and so this house owned by Jesse Cossham was actually in what we would now know as Chapel Street. Laura Williams. We believe that unusually the Laura Williams who owned this property from about 1892 was the daughter of the occupants, Francis James and Elizabeth Williams (Click here to read about the Williams family). The 1911 census shows that Laura was the principal of the Nursing Home in Pembroke Road in Clifton, Bristol. By this time she was a single lady aged 42 years. Arthur and Lilian Bartlett. The 1926 rate book shows that Mrs Bartlett owned this property and the one next door (4 Chapel Street). The house that became 2 Chapel Street was occupied by Arthur Bartlett. Arthur John Bartlett was baptised the son of John and Eleanor Bartlett of Thornbury at what became the United Reformed Church on 21st August 1889. The Bartlett family seem to have been all butchers and it is no surprise that in the census of 1911 aged 22 he was working in the family business at 4 The Plain with his parents. Aged 22 he was single and a butcher. His sister Hilda was still at school. The Gazette of April 6th 1918 reported on Arthur’s injury in World War I under the heading ‘Gassed in the Big Battle. ‘ It said that ‘We hear that Arthur Bartlett son of Mr J Bartlett butcher of Thornbury is in hospital in France suffering from the effects of gas in the recent big fighting on the Western Front. He belongs in the Drake Battalion connected with the Royal Navy Division.’ We were wondering why the Royal Navy were in the trenches and are grateful to Wikipedia for this explanation. The division had been formed (at the direction of Winston Churchill, the First Lord of the Admiralty) at the outbreak of war as the Royal Naval Division. The division was composed largely of surplus reserves of the Royal Navy who were not required at sea, who formed around a cadre of Royal Marines. The division participated in the defence of the Belgian city of Antwerp in late 1914. From Antwerp, 1,500 sailors of the division fled to the neutral Netherlands, where they were interned. The division was shipped to Egypt prior to serving in the Battle of Gallipoli where it fought on both the Anzac and Helles battlefields. By the end of the Dardanelles campaign, casualties were such that the division no longer contained a significant number of naval servicemen and so in July 1916 it was re-designated as the 63rd Division when the original Territorial Force 63rd (2nd Northumbrian) Division was disbanded. The division moved to the Western Front in France for the remainder of the war. Arthur survived the War and came home to continue his career as a butcher. He married Lillian Wheelan Chorley in the Bristol area in 1919. The electoral registers from 1921 to 1925 shows Arthur and his wife, Lilian Wheelan Bartlett lived at 18 Gloucester Road. They had two children: Edna K born in 1922 and John C born in 1924. By 1927 the family had moved to 2 Chapel Street. In February 1929 Arthur Bartlett submitted a plan for a new slaughter house and other facilities at his premises in Chapel Street. Above we have the detailed plan of the building at that time. Arthur was listed as trading as a butcher in Chapel Street in the 1935 and 1939 trade directories. In 1937 the Gazette had a report of a fire, believed to have been caused by children playing with matches. A hayrick of Arthur’s had caught fire and burned all night. The hayrick was in his field which was said to be opposite the Black Horse pub in Gillingstool. Mention was also made in the article of his butcher’s shop in Chapel Street. The 1939 register compiled in preparation for the war lists Arthur, Lillian and two other persons in the property. The two others were ‘blacked out’ so we are unable to identify them. The register shows Arthur was born on 19th June 1888 and Lilian born on 2nd December 1885. The 1946 electoral roll shows that that their home at 2 Chapel Street was called ‘Fergus House‘. Like his father before him, Arthur was a staunch member of the Congregational Church of which he was a deacon for many years. Arthur died on 10th February 1950. He was aged 61. His memorial inscription says that he passed away after much suffering. His wife died on 7th March 1953 aged 68. Edna Bartlett was a Sunday School teacher and the United Reformed Church records show her at the Sunday School in 1939. The records of the United Reformed Church also show the marriage of Edna Kathleen Bartlett only daughter of Mr and Mrs A J Bartlett of Chapel Street at the Thornbury Congregational Church on 30th August 1948. Her husband was Stanley Bower Clark an engine storekeeper aged 33. He was the son of Mr Horace Bower Clark and the late Mrs Clark of Teddington Middlesex. The newspaper said that the couple were planning to live at 138 Chaldon Way, Coulsdon in Surrey. Apparently the children and teachers of the Primary Department of the Congregational Sunday School gave a flower pitcher and the teachers and the Junior Department gave a glass biscuit barrel. John Barlett married Iris Payne the daughter of Mr and Mrs E. G. Payne of Ford Farm Chewton Mendip in 1950. The property (described as Fergus House, 2 Chapel Street) was advertised for sale in 1953. It had two floors. The ground floor had two front sitting rooms, kitchenette, dining room, kitchen and back kitchen with ‘Sentry’ boiler’, sink and pump. The first floor had four bedrooms, a bathroom and W.C. At the rear of the building were an outdoor larder, storeroom with salting boiler below, wash-house, stable and tie-up shed, slaughterhouse, open shed, greenhouse and potting sheds. One of the front sitting rooms, the kitchenette and one bedroom was being let to Mrs Pitt for £1 per week. The Bayntuns. The electoral registers of 1954 and 1958 show that Robert and Betty Bayntun lived in this property. Robert Hippersley Bayntun was born in Bristol on 26th March 1925. He was the son of Robert Francis and Mildred Kate Bayntun (nee Weeks). Robert was a quantity surveyor. He married Betty Warwick Cunningham (nee Barnes) in Bristol in 1948. Betty Warwick Barnes had been born in Bristol on 2nd February 1922, the daughter of Percy Barnes and his wife, Ellen Maria (nee Warwick). Betty had married Jack A Cunningham in the Chippenham area in 1944 and we don’t know what happened to Jack. Robert and Betty had two sons, Timothy Francis born in 1949 in Bristol and Christopher Hippesley who was born in Almondsbury in 1952. The 1950 electoral register for Thornbury shows that the Bayntuns were sharing the house of Mildred’s mother at 8 Chapel Street. On 25th July 1952 Robert and Betty bought the house at 8 Chapel Street from her mother, Ellen Barnes for £700 and the family moved to Thornbury. On the 18th November 1953 Robert and Betty Bayntun sold 8 Chapel Street and they moved to live in 2 Chapel Street where we understand they took over the running of the butcher’s shop. Following the death of Robert’s father in 1957 Robert and Betty moved to live in his parent’s house at 79 High Street. The 1961 electoral register shows them living there and his mother had moved to live at 4 Chapel Street. Robert and Betty continued living in the High Street until Robert died in 1986. We understand that Betty then went to live in Cheltenham for a few years, with her son, Timothy, and his family. In 1987 Betty sold 79 High Street. She returned to Thornbury about 1995 where she moved into live at 62 High Street. Betty died in Cheltenham in July 2000 aged 78. Jacqueline Hulbert Haines. In the electoral register of 1961 Jacqueline H Haines lived at 2 Chapel Street. Jacqueline Coles was born in 1915. She married Basil Haines in Bedford in 1945. Sadly Basil died in 1961 in the Devizes area. On 28th April 1965 Jacqueline Hulbert Haines of Rose House Sibland Thornbury sold for £4600 “all that piece or parcel of land and outbuildings erected thereon or on part thereof situate fronting upon Chapel Street in the town and parish of Thornbury……all which said hereditaments were formerly known as Fergus House and are now number 2 Chapel Street.” Jacqueline died in Salisbury in 1972 aged 56. The Parish Council bought this property in 1965 from Jacqueline Haines. It was eventually demolished to build the new Armstrong Hall which was opened in 1972 and to provide a public access from Chapel Street.